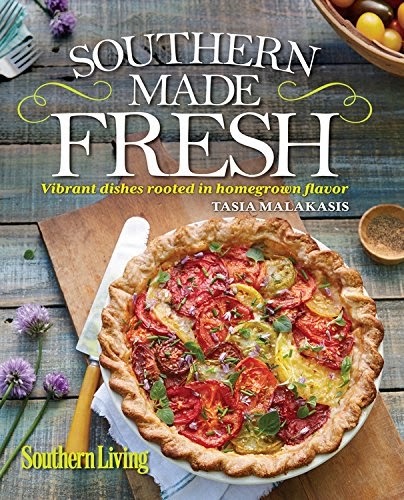 Southern Made Fresh is another beautiful addition to the Southern Living cookbook family. Written by Tasia Malakasis, the owner of Belle Chevre Creamery in Elkmont, Alabama, this cookbook features unique recipes that incorporate fresh from the farm (and creamery) ingredients. Let's start the journey with breakfast and brunch recipes such as Mushroom & Green Onion Scramble, Spicy Andouille Spanish Tortilla, Grits with Red-Eye Gravy and Baked French Toast with Banana Brulee. We then move to an extensive selection of salads, dressings, and sandwiches. Light lunches are served in the form of various soups, a Tomato Pie with Fresh Corn & Herbs, and Pasta with Green Tomatoes & Goat Cheese. Stick around for the nibbles and cocktail sections of the cookbook. 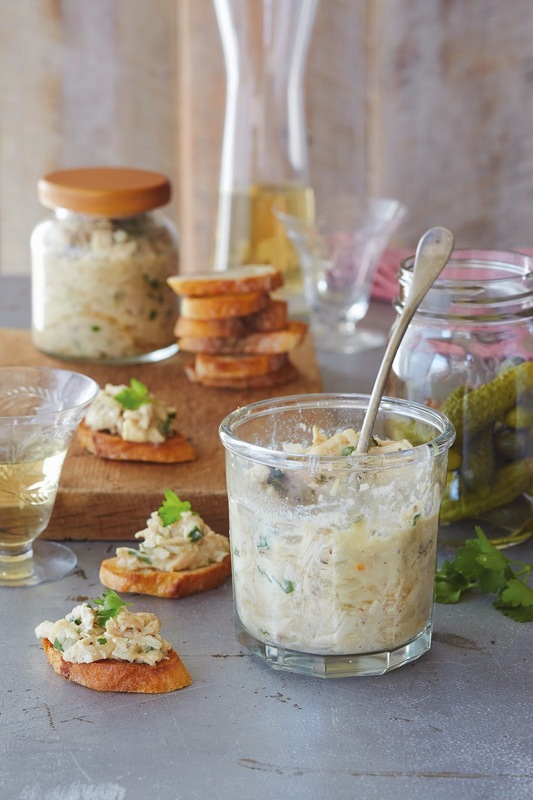 The Nibbles chapters includes the recipe that I've featured here, Chicken Rillettes. 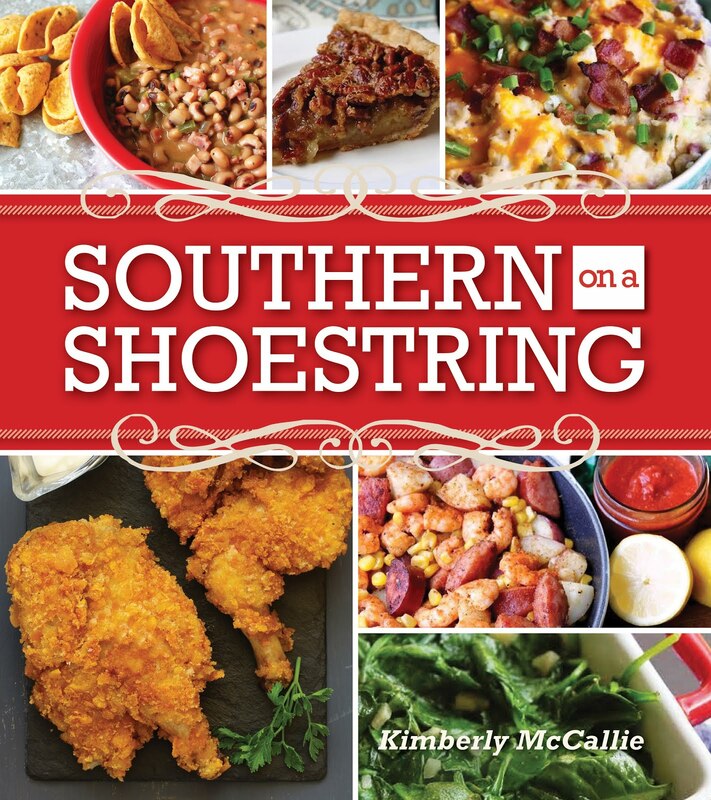 The Sips, Shakes, and Shines chapters features my favorite recipe from the book, Pickle-Brined Pan-Fried Chicken. Our culinary journey through Southern Made Fresh concludes with supper recipes such as Spicy Ginger-Chicken Lettuce Wraps, Peanutty Braised Chicken, and Deconstructed Chicken Pot Pie followed by desserts such as homemade Moon Pies and Banana Pudding Trifle. Yes, the word "fresh" is in the title of the book, but it's also the first word that comes to my mind when I try to summarize the vibe of this cookbook. Fresh ingredients combined with the author's fresh perspective on cooking are brought to life through vibrant photographs that make me want to hit the fast forward button on my backyard garden so that I can bring these recipes to life in my own kitchen sooner rather than later. Rillettes is just a fancy French word for pulled meat that’s combined with flavorful herbs, butter or lard, and a little cooking stock. They are traditionally served in little jars, which I find both adorable and convenient. You can make them with almost any meat. Serves: 12,Hands-on: 26 min.,Total: 4 hr., 36 min. 1. Melt ¼ cup butter in large heavy skillet over medium heat. Add shallots; sauté 4 minutes or until tender. Add remaining ¾ cup butter to skillet; cook 2 minutes or until butter melts. Stir in thyme, chicken, and stock. Bring to a simmer; cook 10 minutes or until chicken is moist and tender and liquid is almost evaporated. Remove from heat, and cool 10 minutes. Stir in parsley and mustard. Sprinkle with salt and pepper. 2. Pack chicken mixture into 2 (8-oz.) jars. Cover and chill at least 4 hours. 3. Serve rillettes with crusty bread or baguette slices and pickles. Disclaimer: The publisher provided with a review copy of this book; however, the opinion expressed here is my own.